Charles Fipke's homebred Verve's Tale ran down the favored Lewis Bay to upset Saturday's G3 Comely Stakes at odds of 20-1, crossing the wire a half-length in front. The sophomore daughter of Tale of Ekati, ridden by Paco Lopez, covered nine furlongs in 1:51.89 over Aqueduct's fast main track for trainer Barclay Tagg. Lewis Bay burst out of the starting gates in front of the field, but was quickly joined by both Big Mara and Mo d'Amour. Approaching the first turn, Lewis Bay appeared to act up a bit, hesitating and dropping back to donate the lead to Mo d'Amour. 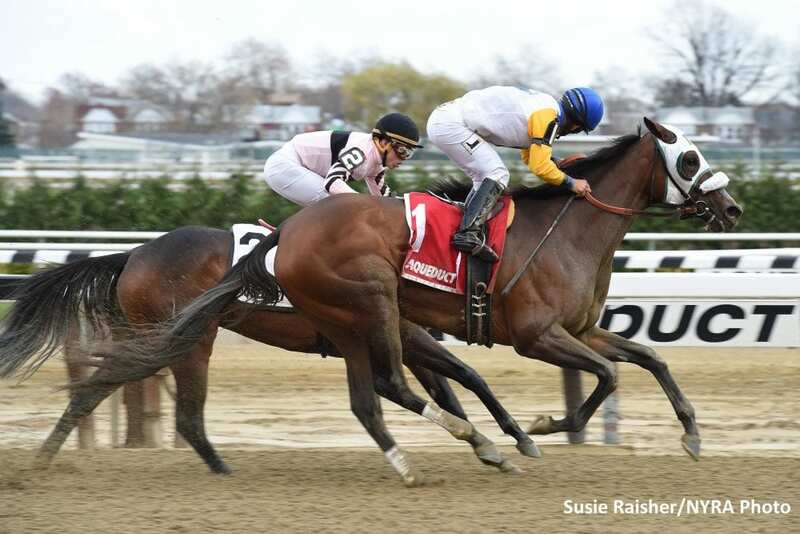 Jockey Irad Ortiz, undeterred, guided her to the outside and allowed her to find her stride once again. Meanwhile, Verve's Tale was tracking the pace comfortably from fourth, saving ground around the first turn. Through early fractions of :23.93 and :48.47, Mo d'Amour dueled with Big Mara. Lewis Bay came up to regain her lead mid-way through the far turn, looking like an easy winner as she turned for home 1 1/2 lengths in front. Verve's Tale kept on grinding, taking up second at the head of the lane. With a sixteenth of a mile to run, Lewis Bay still had a two-length lead, but she suddenly shortened stride, appearing tired. Verve's Tale was able to close down the middle of the racetrack to out-finish the favorite, winning by a half-length on the wire. Lewis Bay had to settle for second, with Going for Broke getting up to be third. Flora Dora came from the rear of the field to be fourth. Bred in Kentucky by her owner, Verve's Tale is out of a daughter of Unbridled, making her a full sister to 2015 Preakness runner-up Tale of Verve. The filly took a long time to break her maiden, finally figuring it out in her eighth start though she had never finished worse than third. The Comely is her second win in a row, and her first graded stakes win, bringing her career record to two wins, five seconds and two thirds from nine starts for earnings of over $250,000. This entry was posted in Racing and tagged aqueduct, Barclay Tagg, charles fipke, Comely Stakes, lewis bay, paco lopez, Tale of Ekati, tale of verve, verve's tale by Paulick Report Staff. Bookmark the permalink.